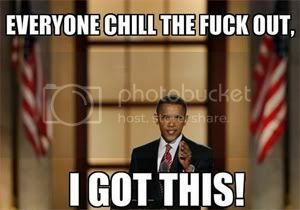 ...our new president is Mr.Obama..john Mccain has just announced he is conceding. Conceded because he knew he never stood a chance!! What do you think to your first ever black president, Laura? I think he will try and do a kamikaze, wipe out all Americans (wish that ) then then... dunno. So, congratulations with your new president!! Long live Obama. Down with hatred and racism. I rather have him than some dumb imbred hillbilly. If some one doesn't like my comment I apologize but will not retract. That's a bit racist, Nicholas!! !